Yup, another Twin Jewels project post. I have written about the project several times before, but if you haven't read about it and would like to know more, you can check it out here. However, this Twin Jewels post lacks the certainty and self-assuredness of my prior ones. Why? Because I am having difficulty evaluating a photograph that I am considering including as part of the project. Therefore, any honest and constructive input is truly appreciated. The image is entitled, at least tentatively, "Color In Motion". I took this photograph on a Spring morning, while the wind was blowing. What originally attracted me to the scene were the very saturated colors in the yellow buds on the short plants as well as the reds and yellows in the leaves. To me it looked more like Fall than Spring, but there it was. 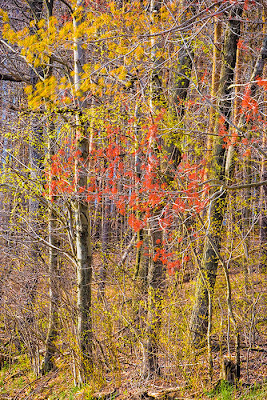 I was hoping to capture the sense of Spring renewal in a semi-abstract way....splotches of color on a canvas. I have some straight shots from when the wind died down with no motion blur to the leaves, but I actually thought that the motion blur of the leaves in the trees conveyed the feeling of the wind and helped transmit a nice feel to the image. The contrast between the leaves that were moving and the shorter yellow plants that demonstrated very little, if any, motion blur was also very appealing to me. One problem in evaluating the image on the web is that the blur of the red and yellow leaves on the tree doesn't come through very well at the very small image size that Blogger allows. On one level I really like this shot. I like the color pallete and the way the color is seemingly coming from all over. What I don't like is the lack of 'simplicity'. In some ways the scene looks too chaotic to me with just too many twigs, trees, and undergrowth. I think it might have been more effective had the blurred colorful tree leaves been on a simpler background. Yet, when I look at it on another level, not expecting a ‘beautfully composed’ landscape, but just allowing myself to step back and enjoy the colors and the way they play off each other…well, then I like it. It seems to appeal to me on that level despite the lack of simple lines. I fully realize that the art is for myself and should not be predicated on how I think others will react to it (see my review of Art and Fear by Bayles and Orland). Nonetheless, my feelings about the image are mixed and so I seek other opinions. What do you folks think, keep it in the project or out...and why? A thumbs down or just a so-so gives it the boot as I am trying to be heavy-handed with my editing.